There, I’ve said it. I love Good Chocolate. There are two types of good chocolate. The first is that amazing concoction that just makes you tingle from head to toe. Your eyes close and you feel the chocolate melting in your mouth, the tension melting in your muscles, your mind becomes singularly coated in deliciousness. That kind! The second kind is chocolate that does good. You know what? They aren’t mutually exclusive. As a matter of fact, all of the second kind that I’ve found definitely fits into the first kind. As a side note, there’s a lot of bad chocolate out there, too. 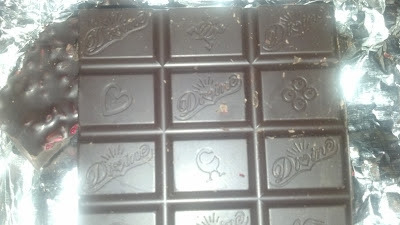 Sometimes I partake of mediocre chocolate, but I just don’t have time for the bad stuff. I’m not going to name names, but you know you’ve had it, too. Another thing that you will notice is the price. This might be a little concerning, but it’s also a little misleading. Most of the “Good” chocolate will come in bars that are nearly twice the weight of a standard candy bar and, therefore, the cost per ounce is not that different. When you do the math you’ll see. Here’s a good reason to learn your proportions in math class!! Look at all the "research" I did for you! The labels and packaging on these chocolates give you a lot more information than just the flavor and how many fat grams you’ll be consuming. They are normally Fair Trade Certified and/or organic, even non-GMO. I’ve also found that the labels are often beautiful. You get some cool graphic artwork as a bonus. The labels may even depict a specific charitable focus. How’s that for shopping with a purpose? Want to help provide bikes for people in Africa to get to a job? Great! Buy that chocolate from Theo – you can get it at REI and online. It happens to be a dark chocolate with Sea Salt (doesn’t just everything have sea salt now??). See the little symbols imprinted? Cool!! Divine Chocolate prints their story on the inside of the wrapper. They imprint the squares alternately with their name and traditional West African Adinkra symbols associated with hand-made crafts. So, you get to learn something at the great time. You know how I love learning!! Disclaimer: this post is being fueled by Divine 70% Dark Chocolate with Raspberries that I purchased at World Market – for research, of course. 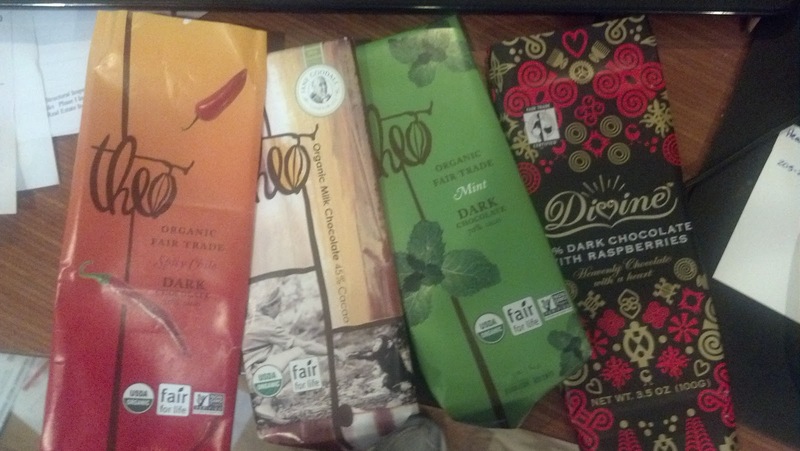 Why do I care if chocolate is fair trade or organic or charitable? It’s kind of like the coffee issue. Chocolate is like the force and has a dark side, pun intended. There’s a narrow band wrapped around this planet that we live on where cacao trees grow. This band wraps through less than prosperous regions. This is a luxury that you would think would be very profitable for the growers, but it isn’t. Wouldn’t you be okay with supporting the farmers and their families more directly than, say, an amusement park? Just a thought. I’ve also been studying the New Testament book of James lately. I’ve been struck by how certain passages can be translated and applied to my 21st century lifestyle and choices. In particular, are the verses in chapter 5 that warn of wages being held back from the laborers by fraud. While I haven’t participated in this directly, I feel a certain twinge of conviction knowing that I have the economic power to choose which business practices I support. This isn’t to say that you must never eat a 3 Musketeers bar again. It’s just one more example of how living a just life can play out today. I’ve mentioned just two of the chocolate companies out there doing good. Do you have another favorite that you would like to share? I’d love to learn about them. Now go out and get yourself some GOOD chocolate!